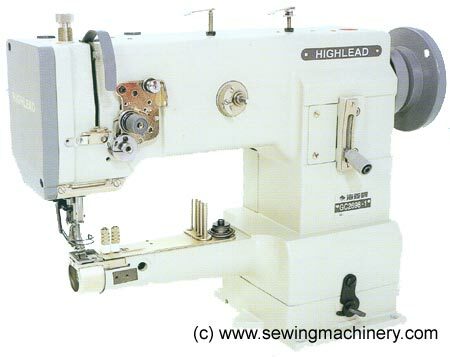 The Highlead GC2698-1B is narrow cylinder arm, single needle lockstitch sewing machine with walking foot and enlarged 1.4x hook & base. It features: a heavy duty triple feeding action by way of: bottom feed, needle bar feed and walking foot top feed, which combine together to produce high quality displacement-free seams. 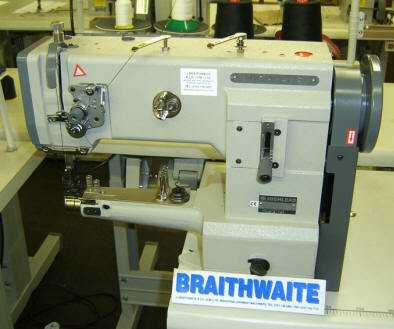 The Highlead is of a robust construction for industrial heavy duty use and its features also include a front mounted bobbin winder for easy use and quick change over, plus a reverse lever with combined stitch length adjuster. A full synchronized binder version is also available which features a special triple feeding set and synchronized bottom plate with binder attachment for professional binding applications. The Highlead GC2698-1B is supplied as standard complete on a "off the arm unit stand" which means the cylinder arm overhands the end of the unit stand allowing for easier access and improved versatility. 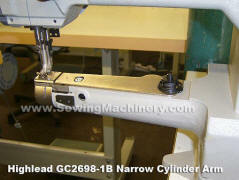 UK model supplied with Highlead UK warranty. 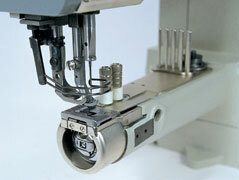 Linzbek servo needle position motor with speed and acceleration control.